This is the Greek cousin of ratatouille. Spending a few minutes frying the vegies before putting them in a roasting pan reduces the cooking time and gives a tastier result. Set your oven to 200°C (180°C fan-forced). While the oven is warming, heat an oven-proof frying pan over high heat and add a little of the oil. Fry the eggplant, zucchini, onion and potato in batches until lightly browned on both sides (you can use two frying pans to speed up the process). Add more oil as necessary, but remember that the eggplant will soak up much of the oil you use, so don't add too much. Later, as the eggplant roasts, it will release its oil. When the vegetables are fried, heat about 2 tbsp of oil in the same pan and lightly brown the garlic. Place the tomatoes in a single layer on the base of the roasting pan and top with the fried vegetables in layers, seasoning with salt and pepper and scattering with dried oregano between the layers as you go. Roast for 30-40 minutes, until the vegetables have browned and softened. 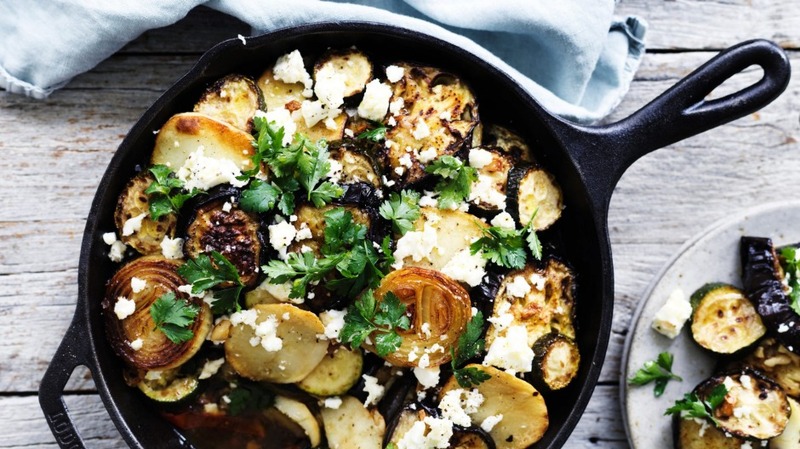 Remove from the oven and serve in the pan, topped with crumbled feta and the finely shredded parsley. Adam's tip You don't need to salt eggplant before cooking. The eggplant varieties we eat today are much less bitter so salting, which draws out those bitter compounds, is no longer necessary. Try Adam Liaw's souvlaki-style lamb chops.